Martial artists try to practice mushin which is Japanese for “no mind”. This concept, if you’re unfamiliar with it, is to empty your mind of all thought while training or performing. Athletes and artists in all fields preach the benefits of not thinking, explaining that thinking inhibits action. By combining relaxation and meditation techniques in times of pressure and stress, you can perform better and make difficult physical and mental tasks seem easy. This sounds great, doesn’t it? But mushin seems like a state only achieved by the masters of a discipline. Many explain the importance of having “no mind”, but no one really explains how to achieve it. Here’s a quick set of tips to help you learn to do it. 1. Get really good at your chosen art. Whether it’s martial arts, playing the piano, designing topiary, or writing blog posts, the first thing you need is skill. Think of learning to ride a bike: you spend so much effort trying to develop the technique and balance needed not to fall off, you fall off a lot. After a while, you get good enough at riding the bike, and you don’t have to think about it anymore. The same goes for any other discipline; if you still have to think about getting things right, you won’t be able to achieve a state of mushin. First practice your art until you have a high level of proficiency. This might seem obvious, but you need to eliminate extraneous thought in order to achieve mushin. Let’s use the bike riding analogy again. When you learn to ride your bike, what is the next thing that normally happens? You ride well enough not to think about riding, but it’s easy to get distracted. It’s a lot of fun to ride your bike while watching your surroundings whoosh by–especially downhill. This is usually a relatively safe practice, but do you remember what happened when you were a kid? Do you still have scars? If you’re like me, you probably crashed your bike at least once because of distractions. If you’re not paying attention to potholes, dogs off the leash, or even oncoming traffic, you could be in trouble. When learning to be mindless in your art, try your best to avoid distractions. Block out the things that draw you away from your practice. You may need to cross train in other forms of meditation to really get the hang of this. As you get better at clearing your mind while just sitting and breathing, for example, it will be easier to clear your mind while painting a landscape. Imagine this. You’re ten years old. Your best friend just “built” a bike ramp out of a thin piece of plywood and rocks. He wants you to help him test it out. Do you do it? Of course! The daring nature of youth (i.e. stupidity) leads us to take risks. After a few scraped knees, however, most of us lose our taste for risky behavior. I’m not advocating for you to put yourself in harm’s way, but to really achieve mushin you need to get out of your comfort zone. Sure, you might be able to relax and concentrate while practicing your art alone, but what about in front of an audience? Do you lose your resolve? Think of challenges that force you to double your efforts at staying calm and focused. For example, if you practice martial arts, do your forms outside or in front of an audience. If you like to write, try to get something published. Knowing that someone else will read your work makes it harder to finish when the infamous “imaginary editor” is shouting at you while you write. If you dance or play piano, give a recital. Once you master mushin during one challenge, think of a new one! Perhaps the best reason to cultivate mushin is how it affects the rest of your life. Learning to relax while training and performing helps you to keep your cool during trying times. Some people are born with a remarkable ability to stay graceful under pressure; the rest of us need to work at it. 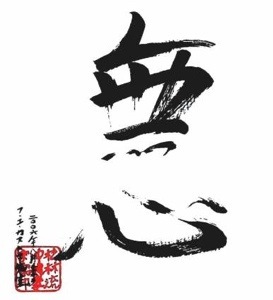 Consider the “zen” applications of mushin in your art, but remember that it can help you throughout your everyday experiences as well, helping you to better enjoy the good things and to overcome any struggles you may face. Sorry it took so long to comment on this, Mike. I hope you’re well and that we can train together soon! Thanks! I appreciate it. Now if it were only easier to do! I attained mushin (no-mindedness) while I was in prison. Though I no longer have that state of mind because I am bed ridden from an injury. There are different levels to this state of mind. Once attained it is hard to keep. To much sleep and eating to much can in a way make you not tap in to that mind. to truly attain this mind is through hard training. After 2 hard years in prison. I nearly fasted for over 30 days inside a cell. I been though some stuff. At another point 2 years after that I had a celly who would do splits all day, 1000’s of push ups ,squats, etc inside a cell. he also read college books all day. this not your a average celly. So, I followed his ways. I stretched for the first time in my life and for the next 3 months that I spent remainder in that cell. I stretched for about 4 hours a day, ran In place and pumped push ups and squats. being locked down for 22 1/2 hours a day. I finally got a job outside my cell which I worked 3 days and it happened to be my last 3 days I spent in that cell and in that prison. Those 3 days I spent walking around and playing cards and chess for 7 hours a day. it had caused me to actually use my mind and kept me awake for 3 days straight. Just by doing that caused me to stay stimulated and which I attained mushin ( wu-shin or no-mindedness) from then on life was a new way of walking. I continued my training to this day. stretching is important it stretches your body and your mind. there are different level of this state of mind and you will see the world as it truly is. You will see everything in its natural state and immune to emotions. so, in other words walking like a wooden doll that has no-ego or emotions, but ever so flexible. In 3 months I attained the mind of a master. to master this mind is hard. to keep this mind is even harder and is the way to master it, as well. If you have any questions feel free to ask me. Wow, Mathew. Just wow. Thanks for sharing your story! Did having your celly as a mentor really help you get started? What are some tips to maintain the mindset you have mastered?